Unique oceanfront location! 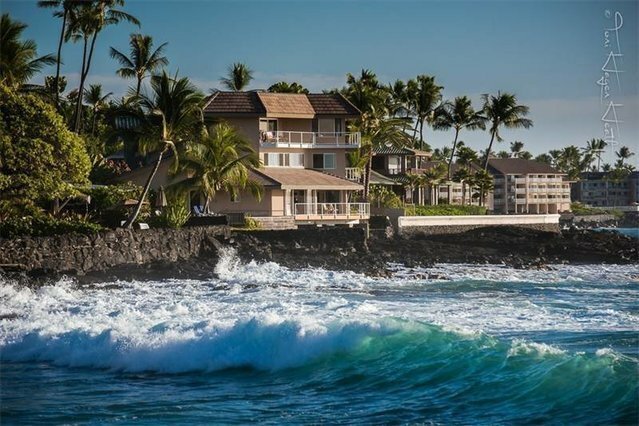 Just steps from one of Kona’s white sand beaches and walking distance from downtown shops and restaurants this home is the quintessential Kona beach house. Perched over the pacific ocean this special location that allows for views of all of the ocean activities in Kailua bay such as sport fishing, canoe racing and parasailing. Watch the pods of spinner dolphins from your deck while enjoying your morning coffee. Have a glass of wine in the evening as you enjoy year round sunsets. At almost half an acre of oceanfront property this oversized lot is close to three times the size of neighboring lots. In addition to a beautiful home you’ll find a spacious driveway, three car garage and large grassy lawn. If the billions of gallons of ocean isn’t enough for you there’s even enough space for a pool! Once inside the privacy of the gated entry you’ll feel the like you are in your own oceanfront sanctuary. Designed for ultimate privacy there are no windows facing the street to eliminate any noise other than the ocean. Wrap around decks, large glass windows and doors on the oceanside of the house allow you to soak in the calm of the ocean. The first floor features a large great room, spacious kitchen with granite counter tops and half bath. The second level includes 2 bedrooms each with ensuite baths. The entire third level is the master bedroom. After a 2 year remodel the home has been redesigned from its original structure and meticulously cared for. The current home has been engineered to withstand the ocean and Hawaii’s tropical elements. You’ll find structural and engineered details such as concrete caissons, a concrete tile roof with cemented seems and ridge lines and treated lumber throughout the home. The only three story home on Alii Drive on a rarely available oversized lot this house is a true gem on the Kona Coast.